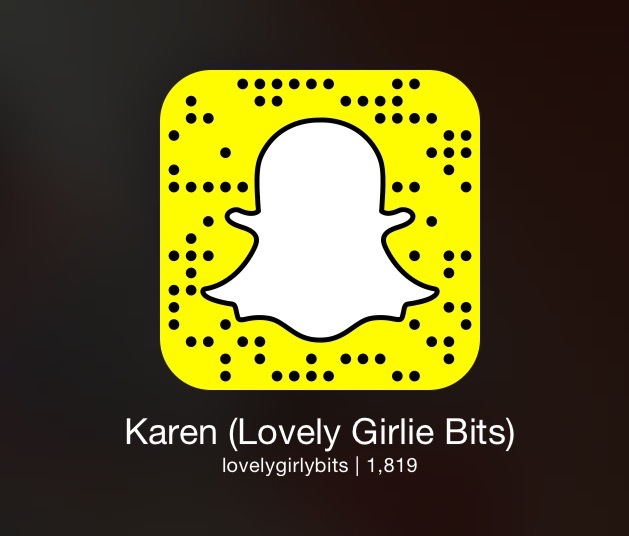 Lovely Girlie Bits is on Snapchat! Ok, I don't think an app has ever made me feel as old than Snapchat has. I've never come across something that I literally didn't know how to use or navigate right from the get go and despite one of the girls at work showing me how to use it (which made me feel like my mam when we're trying to show her how to do stuff on her phone), I hadn't a baldy notion what I was doing. A bit of googling and searching on YouTube for tutorials and now I get it! And I love it! For me, it's like daily vlogging but without the editing and it's a way to show the mundane bits of my life. I don't pretend to be constantly flouncing around going from event to event. More often than not, you'll see me snapping from my couch in my pyjamas, hair up and no makeup with double chins galore and that's real life and that's what I love about it! Anyone I follow (which is pretty much everyone who follows me because I'm addicted) is laid back, doesn't try to show off and is completely down to earth! I love the interaction of Snapchat and I love that I get to put faces to names. Because of work, I can't reply to emails and tweets as much as I'd like and so I've gotten into the bad habit of mentally replying to people and then not actually replying to them. It's so bad! But with Snapchat, if I don't reply right away, I can't go back and see what someone has sent me, so I make sure I set aside time to open everyone's snaps and reply right away! With Instagram, it's hard to gauge how many people have seen your photo. Yes, you might get dozens of likes, but how can you tell how many eyeballs have been on it. So many times, I've scrolled through my entire feed, back to where I ended things the last time I was scrolling through everything. Then when I go into someone's profile that I'm following, I see a load of photos that haven't come up on my feed. So annoying! But with Snapchat, you can see how many eyeballs saw your snap. I like to be able to quantify things, I'm a weirdo! I like that I get to show you real life, like me making a meal, showing you what products have arrived that day and what products I'll be reviewing. I've shown you my pubicles many times (current Snapchat followers will know what I'm talking about! ), I've shown you the constant mess in my beauty room, behind the scenes when filming and blogging, I've brought you on trips away and I really do love sharing these aspects of life with everyone! I think this is going to take the whole blogging and vlogging thing to the next level and I shall make it my mission to get everyone I know on it! I'm still toying with the idea of Periscope, but more often than not, when I'm snapping or snap chatting (which is the right word?!) I get tongue tied or forget what I'm saying and need to refilm, so maybe live vlogging isn't for me just yet! Are you on Snapchat? Go follow me and I'll follow you back, or leave your username in the comments below! MAC Le Disko collection - Dazzleshadows review! Little chit chat catch up! L'Oreal Studio Line Hot & Big - my big hair hero!